Now this one is really exciting for me. I've had the angled pedestal guard installed for a year now in anticipation of this day! Last year I build a NavPod out of plywood and epoxy with the intention of mounting my ST6002 control head right next to the plotter. This is a very functional location, but all along I was not sold on the aesthetics. While I think they look cool on other boats, I just don't think my cockpit was designed to have a NavPod look good in it. At the last second I ignored all my prior effort and simply made a mounting plate for the Chart Plotter using 1/4" marine lumber (Star Board). It bolts to the pedestal guard in each corner and the center is cut out to allow the plotter to flush mount. The wires are then run into a hole in the guard tube which ate up more drill bits than I can keep track of. It was not a pleasant installation activity at all. So now I have the 12 wires for the plotter hanging under the cockpit. Given the length of that cable, it's not going to be possible to put them in a convenient location. The plan is to mount terminal strips down there and terminate the wires there, then hook up the back-feeds into the various NMEA targets, the accessory power distribution, ship's ground, etc. After a bit of research, I discovered that the highest recommendation for NMEA wire is the 20AWG/8 conductor signal cable. 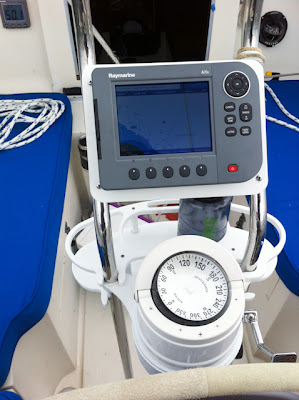 I'm sure it's very nice, but I only need 4 conductors going to each NMEA target, and the AutoPilot Course Computer is on a different side of the boat than the VHF radio. So, I'm not excited about paying for 50% more conductors per foot than needed. I believe that option #2 is to use a few runs of 16AWG/2 conductor per target. If I get a little interference due to the lack of shielding over that small distance I'll live with it. So, next step is to pick up a few terminal strips and see if can get the plotter to talk to the VHF. Going to be some unpleasant boat yoga involved in that installation, but it will be extremely cool to see that plotter finally working. Not necessary at all, but extremely cool.